Glass floor panels (a.k.a. 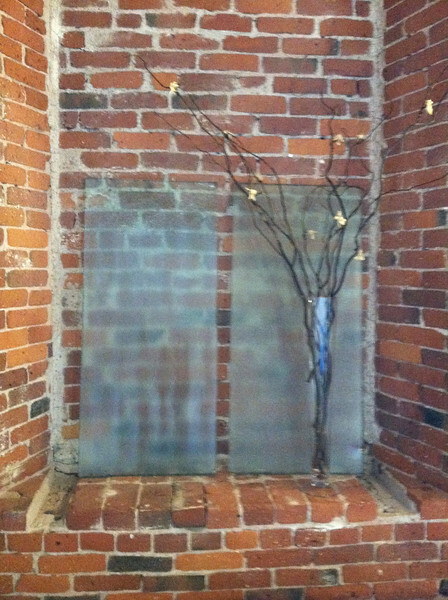 "glass blocks") saved from the 1902 stack wing are for sale as part of the Holyoke Public Library's fundraising campaign. In January 2013, we invited proposals from artists; some finished works were displayed in April 2013. Glass blocks come in several sizes (rounded to nearest half inch): Size A (34.5 x 36"), B (34.5 x 27"), C (34.5 x 25"), D (19 x 23.5"), E or F (19 x 26-27"). Each panel is 1" thick, very sturdy and heavy. Prices depend on size: $ 175 for largest size (A); $ 125 for medium sizes (B, C, G); and $ 60 for small ones (D, E, F). 20% discount for Friends of the Library members. Own a piece of library history! To order, contact Library Director María Pagán, Holyoke Public Library, or ask me (Sandy Ward). This shape (size G) is unusual, measuring 18" by 39.5" -- the longest length of any of the original floor panels. Only three of this size were salvaged intact. As of 1/7/13, this size has SOLD OUT.